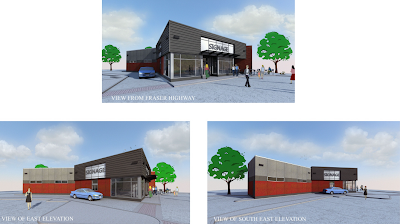 For awhile, I've been following the development application for a proposed drive-thru coffee shop in Downtown Langley. Tonight, the City of Langley will be holding a public hearing on the development permit. I grabbed the site plan and render from the Committee of the Whole agenda. 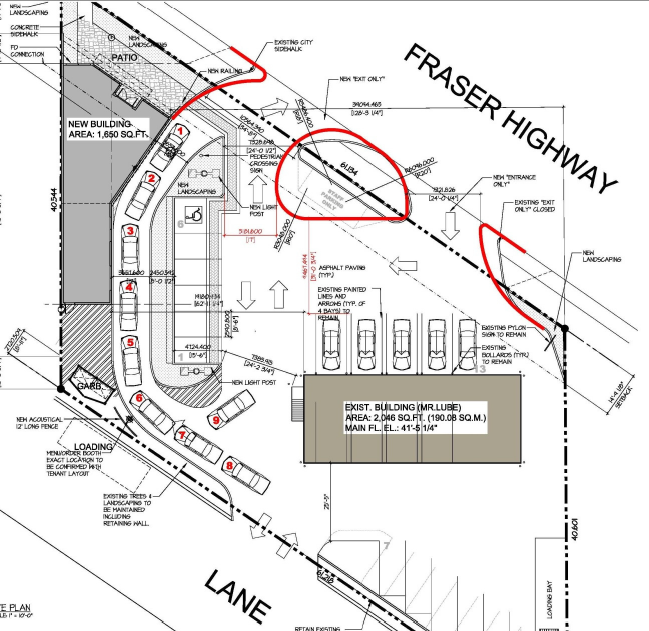 What is good about this application is that the coffee shop fronts Fraser Highway and provides pedestrian access off the street. I do find it interesting that while the City of Langley is trying to build a pedestrian-friendly Downtown, when looking over the development application the plan is to have 60% of the traffic from the cars and the drive-thru. The application spends the majority of the time talking about parking and traffic, but little or no time about cyclists or pedestrians. While the application is not technical in Downtown Langley (it's one building away) more emphases should be put into creating a public space that makes pedestrians a priority. This is the gateway to Downtown Langley after all. Proposed Site Plan for 20112 Fraser Highway. Click Image to Enlarge. Renders of Proposed Coffee Shop. Click Image to Enlarge.